Samantha Stepp, a 2006 member of Memphis Sound, sent this picture. 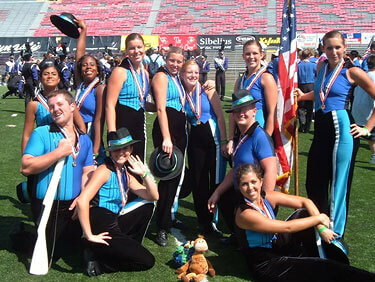 This is a picture of the 2006 "Shades of Blue" Memphis Sound color guard after the Division II & III World Championships. This was my third summer with Memphis Sound and it was one of the best and most memorable for me. I don't think I've ever been as close to a group of people as I was to this one. These people have a special place in my heart, and I miss them so much. It was a summer I'll never forget thanks to these people and our awesome staff: Elter, Kenneth, Justin and Jason. Back row from left: Maria, Brittnay, Samantha, Emily, Ashley, Skuter (Kaitlyn), and Bekah. Kneeling: Chad and Jordan. Sitting: Megan and Merideth. Not pictured: Angela.